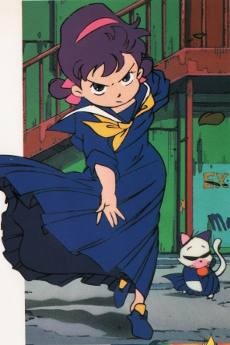 Akko-chan is a bright and energetic 5th grader in elementary school whose father is a newscaster and mother is a picture-book writer. Akko always cherishes the palm-sized mirror that was given to her by her father and treats it with care. However, the mirror was accidentally broken by her absent-minded mother. On a night where a beautiful full-moon hangs in the sky, Akko-chan buries the mirror pieces in the garden and goes to sleep. She is awakened by a soft and kind voice which belongs to the Queen of the Mirror Kingdom. She sends her gratitiude to Akko-chan for cherishing the mirror with care and offers her a magical compact mirror. Whenever she sings the magical words, Akko-chan will be able to transform into anything she wants.